Email address forwarding is completely free with all domain names registered with Locall.Net. 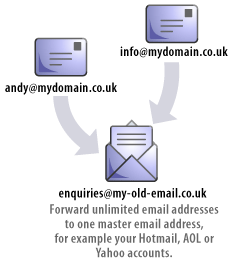 Create unlimited personal email addresses using your own domain name - you@yourdomain.co.uk. Is your email address slightly embarrassing? Email forwarding is the easy way to create a new, professional looking email address - and it's free! As soon as you've registered your domain name, you can create new professional email addresses and use our free email address forwarding service to redirect mail to your existing address e.g. your Gmail or Hotmail account. Professional email forwarding - no ads! Unlike many other providers, we don't add our own signature text or advert links to your emails, even though our email address forwarding service is free. It's always wise to register the domain you want before someone else does, even if you're not yet ready to create your website. With Locall.Net, you can ‘park’ domain names for as long as you like, free of charge, until you're ready to use them.